For fast and accurate gaging solutions, LVDT electromagnetic inductive sensors provide hard contact gages with extended gaging ranges and excellent linearity. 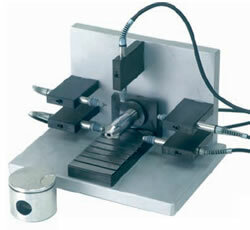 Piston inspection Fixture utilizes LVDT Inductive Probes to check O.D.s and Air Probe to check I.D.s. Vee Gage checks hydraulic valve spool O.D.s utilizing opposed set of LVDT Inductive Probes. 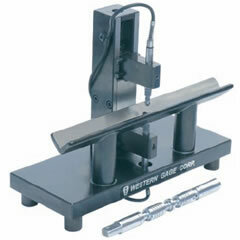 Air Spindle, LVDT Inductive probes & Flexure gages used in inspection stations for scroll compressor parts. Tips are threaded M2.5x.45 (see optional tips below). Other ranges are available on special order. LVA-1 Right Angle Adapter kit for LVS-1 gaging cartridges. LVP-1 Pneumatic push LVDT inductive probe. Same specifications as LVS-1 inductive probe except as follows. LVF-1 LVDT sensor integrated in parallelogram flexure motion transfer linkage. Electrical specifications are the same as LVS-1, add suffix “P” to include pneumatic actuator. LVB-1 LVDT sensor integrated in block style transfer mechanism using linear ball bearings. More rugged and available with greater gaging range than flexure style, but side play limits the gaging accuracy in tight tolerance applications. Electrical specifications are same as LVS-1.